The consumer edition of the Interior Design Yearbook comes hot off the back of the professional edition, after Media One received overwhelming levels of interest for a design book of this calibre for the consumer industry. On sale throughout WHSmith, including high street and travel stores, the consumer edition of the trade ‘bible’, the Interior Design Yearbook, has been produced in association with the British Institute of Interior Design and presents a wealth of design information for the savvy reader, as well as a comprehensive and exciting sourcebook of product suppliers who work specifically in the residential sector. To engage and inspire its reader, the yearbook features a vast gallery of the best residential interior projects from around the globe, with professional design contributors coming together to deliver trend ideas and sound design advice for the year ahead. This is the ultimate must have sourcebook for the interiors marketplace. 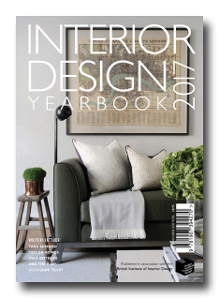 As well as being available on the high street, the Interior Design Yearbook will be on sale at airports and railway stations. Its handy A5 format makes it the perfect size for design savvy travellers. The book features editorial from interior design professionals, including; Kelly Hoppen, The Olive Design Studio, Inchbald School of Design, Lawson Robb, Tom Raffield and Tara Bernerd. This coffee table publication is the perfect resource and advisory tool for consumers and budding interior designers.